For beginners, walking into a gym can feel like walking into a foreign country. There are people performing rituals you’ve never seen before, customs you aren’t familiar with and terms you don’t understand. Add in equipment that looks like medieval torture devices and the gym can be quite intimidating. 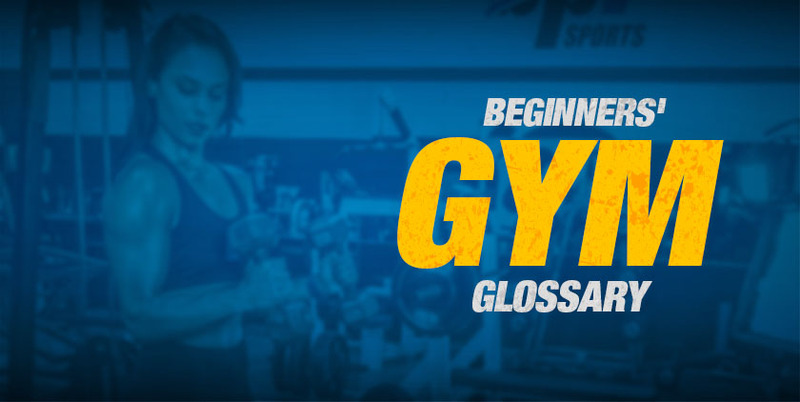 To help alleviate some of your anxiety, we’ve put together a beginner’s gym glossary. This list of terms includes slang and common lingo you’ll need to know to hold your own. 1RM – Short for “one rep max.” This is the maximum amount of weight that can be lifted at one time on a certain exercise. Active Recovery – In order to build muscle, you have to give your body time to rest in between training. However, that doesn’t have to mean lounging on the couch. Active recovery refers to low-intensity activity you can do on your rest day like walking or gentle yoga. Aerobic Exercise – During aerobic exercise your body uses oxygen for energy. These exercises are those that last for an extended period of time, like a long walk, run or bike ride. Anabolic – The bodily process in which muscle is built. Anaerobic Exercise – During anaerobic exercise, your muscles break down glucose (sugar) to use as energy. These exercises are normally short intervals of high-intensity work. Bulking – A term used to describe a period of intentionally gaining weight by putting on muscle. Burn – A sensation experienced in a muscle you’re training caused by the rapid buildup of fatigue toxins. Forcing yourself to push past this threshold and endure the pain is one of the first steps to building muscle. Cardio – Short for cardiovascular training, which strengthens the heart and blood vessels. Catabolic – The bodily process in which muscle is broken down. Cheat Meal – A meal consisting of “bad” foods that athletes on a strict diet will reward themselves with every once in a while. Circuit – A circuit is similar to a round of exercises. You perform one after the other with minimal rest in between. Collar – A clamp used to hold the plates securely in place on the end of a barbell. Compound Exercise – A compound exercise is a move that incorporates multiple muscle groups. Common moves include lunges, deadlifts and squats. Cool Down – This is a period of rest at the end of your workout when you gradually lower your heart rate and calm your nervous system. People tend to use passive stretches or lighter movements to help. Curl Bar – A type of barbell with a more comfortable grip and less forearm strain. Cutting – A term used when one’s goal is to diet, lose fat and reveal the underlying muscle to improve definition. Dropset – This muscle-building technique requires you to lift a certain weight to failure on one exercise, reduce the weight, and lift to failure again. Extension – When a body part goes from the bent position to a straight position. For example, a leg extension. Failure – Training until exhaustion or to the point when the muscles cannot lift the designated weight for another rep.
Flex – The act of contracting a muscle. Foam Rolling – A form of massage that you can do to loosen tight muscles or smooth out knots in the fascia to improve your range of motion. Form – This refers to the biomechanics used during the performance of any bodybuilding or weight training movement. Perfect form involves moving only the muscles required for the movement. Free Weights – Equipment that is “free-standing” such as barbells and dumbbells. HIIT – HIIT stands for high-intensity interval training, which consists of quick, intense bursts of exercise, followed by short recovery periods. Intermittent Fasting – A dieting technique that limits food intake to a certain number of hours per day and requires the participant to fast the remaining hours. Isometrics – Isometric exercises require you to hold a position under tension for a set amount of time. Enduring this uncomfortable position can help you build mental strength so you can push harder in your workouts. Macro – The three main macronutrients are carbohydrates, protein and fats. Max Heart Rate – Calculate your max heart rate to determine your training zone. The calculation is 220- your age. Mind-Muscle Connection – In order to make your muscles move, your brain must be involved. This sounds obvious, but the more you focus on the muscle you’re working during a workout, the more you improve the communication between your muscle fibers and your brain and the more efficient your workout becomes. Negatives – The “negative” is also known as the eccentric contraction. This move is the act of lowering a weight (vs. lifting it) to the starting position slowly, increasing the time under tension. Paleo – The Paleo diet, also known as the Cave Man diet, is a nutrition plan based on the presumed diet of our early ancestors. It is limited to wild plants and animals. Plate – The flat discs placed on the ends of a barbell to increase the weight. The weight can usually ranges from five to 45 lbs. Plyometrics – These explosive exercises help you increase power by helping you recruit muscle fibers faster. Examples include squat jumps, box jumps and burpees. Powerlifting – This sport focuses on the development of max strength in three main exercises: the squat, bench press and deadlift. PR/PB – Your personal record (PR) or personal best (PB) is the most weight you’ve ever lifted on a certain exercise. Pump – Muscle pump is a sensation of tightness that occurs when blood is forced rapidly into a muscle. Experiencing this sensation usually indicates that you have sufficiently worked that particular muscle group. PWO – This acronym stands for pre-workout and may refer to the supplement or a food/drink taken immediately before a workout. For example, my PWO meal. Pyramiding – Doing sets of downward or upward scaling of reps or weight. For example, four sets of 12 reps, 10 reps, 8 reps then 6 reps.
Recovery – The period of rest taken in between workouts. This allows your body to repair and rebuild your muscles stronger than before. Rep – Rep is short for repetition. It is the number of times you lift and lower a weight in one set of an exercise. For example, doing 12 reps of bicep curls means you have lifted and lowered the weight 12 times. Resistance Training – Any exercise using resistance, like weights or elastic bands. Rest Period – The amount of time you rest in between sets and exercises. Shorter recovery periods are best for fat burning and conditioning, while longer rest periods are best for power, strength and bulking. Set – A set refers to how many times you repeat a given number of reps. For example, one set might be 10 bicep curls. Three sets would require you to do 10 bicep curls three times for a total of 30 reps.
Split – A split routine refers to a graining program in which you divide up your muscle groups into different training days. For example, Monday is chest day, Tuesday is leg day, etc. Spot – If someone asks for a spot, it means they want help performing a certain exercise. Steady-state Cardio – This form of cardio refers to exercise where you try to keep a moderate pace throughout. Superset – A superset is a pair of exercises done back to back without rest. Normally, you would choose exercises that work two different muscle groups so one can recover while the other works. Another common combination is push and pull movements. For example, a pushup and a pullup. Tabata – This popular HIIT-style of training is known for it’s fat-burning power. You do 20 seconds of all-out effort followed by 10 seconds of rest. For example, 20 seconds of burpees followed by 10 seconds of rest. A typical Tabata round is repeated eight times for four minutes total. Time Under Tension – How long a muscle is under strain during a set. Vascularity – This is more of a bodybuilding term that refers to the size and number of observable veins on someone’s body. Warm-up – Typically a 10 to 15-minute period of light exercise and/or stretching done before a workout to start the blood flowing. Work In – Usually posed as a question, this term means that someone wants to get a set in on the same machine/bench as you while you rest.